Protector, friend, digger of bones – Sam plays all of these roles. Yet, he stands out from other dogs with his super top-secret, super special powers that include speed, sleuthing and cleaning to name a few! 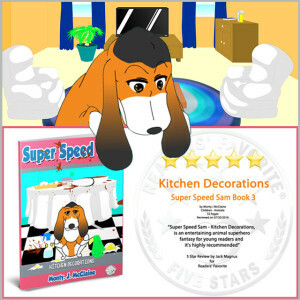 With these powers, Sam can do things like clean up a massive mess, using rubber gloves and spray, in a matter of minutes instead of hours! Living with the McClaine family, including Mom, Dad, six-year-old Jack and baby sister Molly, Sam takes it as his serious duty to keep the kids safe, sound and clean. Yet he keeps his ‘super-power’ skills well hidden from the family’s eyes. Well, from everyone except for Molly – it’s their own little secret! When Mom is called away to the ringing doorbell and Sam’s made sure all is safe at the front door, he returns to the kitchen to get a shock. Left to his own devices, Jack has managed to create a monumental mess! To make matters worse, when Jack attempts to use the electric mixer on his own, disaster hits! Jack flees the scene, and it’s up to Sam, and Sam alone, to do everything, as Molly watches with glee! 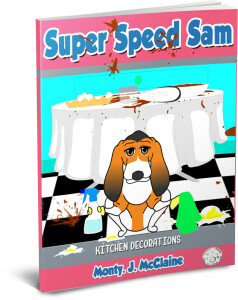 But, even with his incredible abilities, can Sam clean this mess in time – before Mom comes back? Find out in this warm, playful tale – a story children will both love and learn from. It makes a great spring-board for parents and teachers to brooch topics of sanitation and cleanliness in a fun and gentle way. Along with his super special powers, Sam has a vivid imagination. His mind often slips into a dog-friendly dream world for hours. Sam proves a fun and unusual star of the show that all ages will enjoy!